Apache Trout populations are influenced by both short-term, stochastic events such as wildfire and long-term non-native species and land use impacts. Because of the need to determine the status of individual populations after stochastic events as well as assessing long-term changes periodically over time, the Arizona Game and Fish Department, U.S. Fish and Wildlife Service, Trout Unlimited, National Fish and Wildlife Foundation collaboratively developed a monitoring plan for Apache Trout. 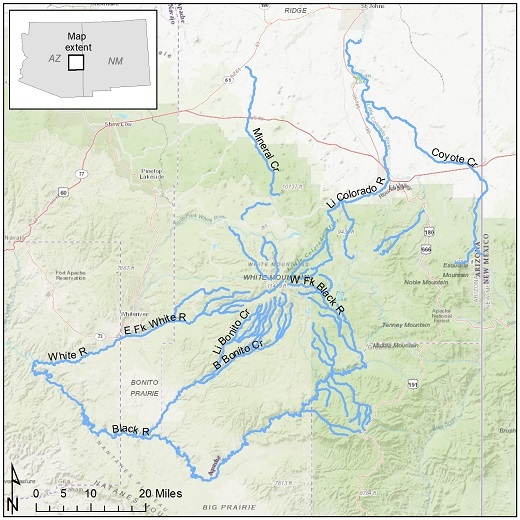 The goals and objectives outlined in the plan are based on accurately and precisely estimating the status of Apache Trout populations on a 5-year interval, and should provide rigorous data on which to base management and recovery actions for the species.